I am ha problems with SDR Sharp, RTL-SDR, and Windows 7. It will run for a little while, then the program crashes and the window closes, but the program still shows up in the task manager. When I try to reload the program, the new instance of it locks up with nothing showing and now two versions of SDRSharp.exe *32 showing in the task manager (and so on, and so on). If I try any other sdr program after SDR Sharp crashes, it locks up just like SDR Sharp. I can't kill the process in Task Manager or using KillProcess.exe, nor can in in the CMD window. I have to reboot the computer before I can use the sdr again. I've deleted and reloaded the latest versions of .Net and Visual C++, and the SDR is all by itself and not on a USB hub. What's wrong and how do I fix it? This is absolutely my arbitrary classification. Post heavily features Nooelec and rtl-sdr.com dongles for one simple reason: they support this blog and send me review samples. Details in Manifesto, links open in new window, tap or click images for full-screen glory. Subscribe to twitter feed @rtlsdr4everyone to receive updates (blue button on left). 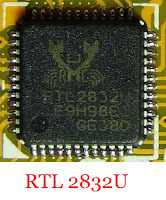 The RTL2832U chipset by Realtek, responsible for converting analog signal received by antenna into a digital form, is the same in every RTL-SDR dongle - hence the "RTL" in the name. All dongles use this chipset, irrespective of cost, size, or accessories. I distinguish generations primarily by tuner chipset, then secondarily by additional characteristics. Exotics not generally available are not discussed. Still with us in various shapes and forms, E4000 no longer available for cheap, R820T is here to stay, because 1) warehouses are probably full of them, and 2) quite a few folks prefer its waterfall cleanliness. 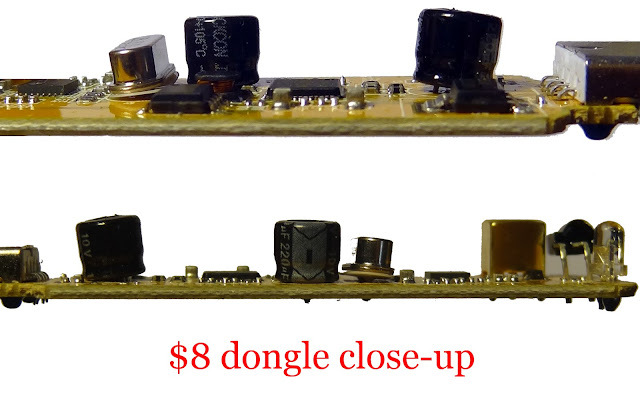 Countless eBay sellers entice customers with this chipset, often at ridiculous prices (read Avoid Ripoffs Part One, Two, Three). Nooelec still sells the Mini, my first receiver for $19, and a smaller version called Nano for $19, and the Mini+ Al for $30 is available, looks dear until you realize that the metal case alone costs $12, and dongle comes with TCXO. 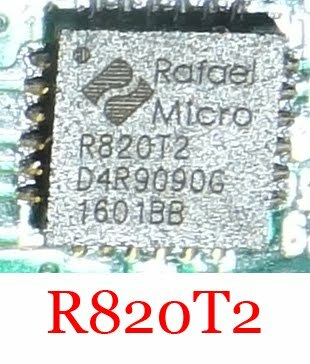 R820T is also used by the Soft66RTL3 for $40, features a built-in upconverter and band preselector; read review here before ordering one (summary: don't). E4000 tuners are a completely different cup of tea, chipset no longer manufactured, better performance on some frequencies and with extended signal reception range. $32 buys you a Nooelec XTR with E4000. R820T2 chipset offers better receive performance across the tunable range - it's the recommended chipset at the moment. Blue $8 generic chinese dongles, and all current premium dongles feature this chip. Nooelec sells R820T2 models as well, full-size in the Mini 2 for $19, small size in the Nano2 for $20. 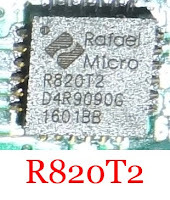 The R820T2 was the last technological milestone, all later developments focus on additional features (some say unnecessary gimmicks) without improving the "brain" of the dongle. Consequently, a bog-standard R820T2 generic will be very, very close in ultimate receive performance to a premium dongle costing twice as much - those features and warranty cost. TCXO, Temperature-controlled oscillators make your life easier, entered frequency is spot on, dongles don't change frequency (called drift) with ambient temperature variations. Do you need TCXO? I was happy without it, as warm-up takes a few minutes, then drift stays the same. For example, SDRPlay doesn't officially come with TCXO for $150. TCXO is good to have, but shouldn't be a deal-breaker. In Nooelec nomenclature, all "Plus" models come with TCXO, such as the Nano 2+ for $23, Mini 2+ for $21. An E4000 with TCXO is also available, called XTR+ for a whopping $38. All rtl-sdr.com dongles are TCXO equipped. R820T2 and TCXO with LNA on board, should be a separate category, because FlightAware's ProStick is the only one, intended for aircraft data collection on 1090 MHz, but underlying PCB is essentially a Generation Four rtl-sdr.com dongle without metal case and thermal pads. As explored earlier, despite sold as an ADS-B receiver, it is an excellent RTL-SDR dongle at a fair price of $17. Parts from TV tuner heritage eliminated by removing LED and IR tuner, passively cooling the dongle with thermal pads and a metal case. 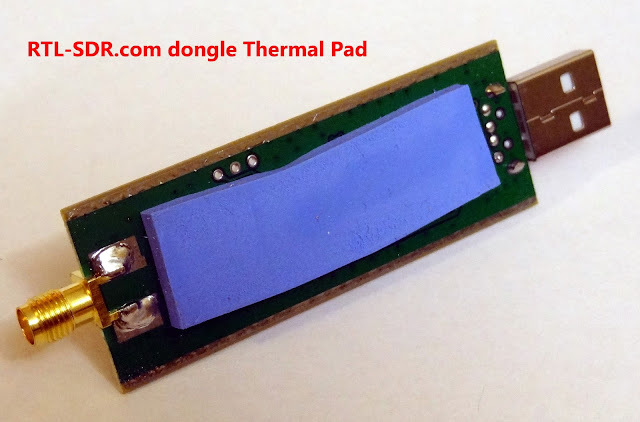 Rtl-sdr.com offered the first dongle with this architecture, instantly establishing rtl-sdr.com as a dongle manufacturer. Great telescopic antennas supplied for $25 cemented well-deserved reputation. In 2016 summer Nooelec's SMArt comes on the scene in a ground-breaking USB friendly shape for $28. Lowered noise, quality accessories, heatsinked plus thermal pad, R820T2 with TCXO, detailed review here. Further efforts to reduce noise, and adding features. Basics (R820T2 TCXO) remain the same. 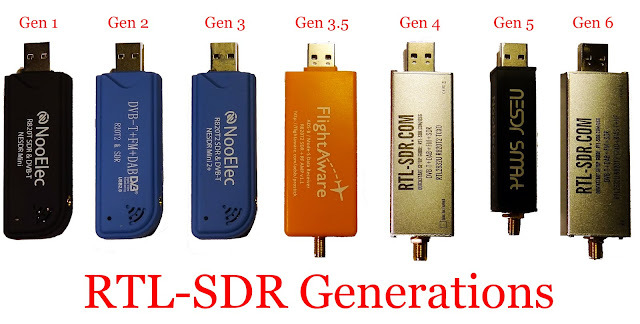 Only dongle in this category is the latest v.3 from rtl-sdr.com for $25. Addition of easy direct sampling to access HF frequencies and improvements to lower noise, plus a few other goodies such as software-selectable bias-T. Review soon. The easiest way to spot older generation dongles is by antennas offered. Two common options: small, black fixed-frequency one or silver telescopic. Always go for the silver telescopic, small black is nearly useless for listening to radio. Works as an ADS-B antenna if cut back a bit and good to check that a dongle works, but pretty much that's it. Nooelec SMArt and rtl-sdr.com come with their own antennas, read relevant reviews for an overview. MCX, PAL and SMA are common. MCX is used on most dongles, small push-in type. PAL is generally found on older Gen 1 or Gen 2 dongles. SMA is the radio industry standard, all premium dongles and SDRs use it. F-type (not shown above) is the TV cable standard in the States and widespread worldwide as satellite TV connector, but not really used on RTL-SDR dongles. Connector type only affects compatibility with other accessories, pigtails and adapters are widely available for 2-6 dollars for various connector standards. Some people say that PAL is inferior for GHz frequencies, I've had no problems with it, even for 1090 MHz ADS-B use. It is widespread in Europe as the standard TV coax connector. If a remote is supplied, the dongle uses TV tuner architecture, and features an onboard IR receiver. 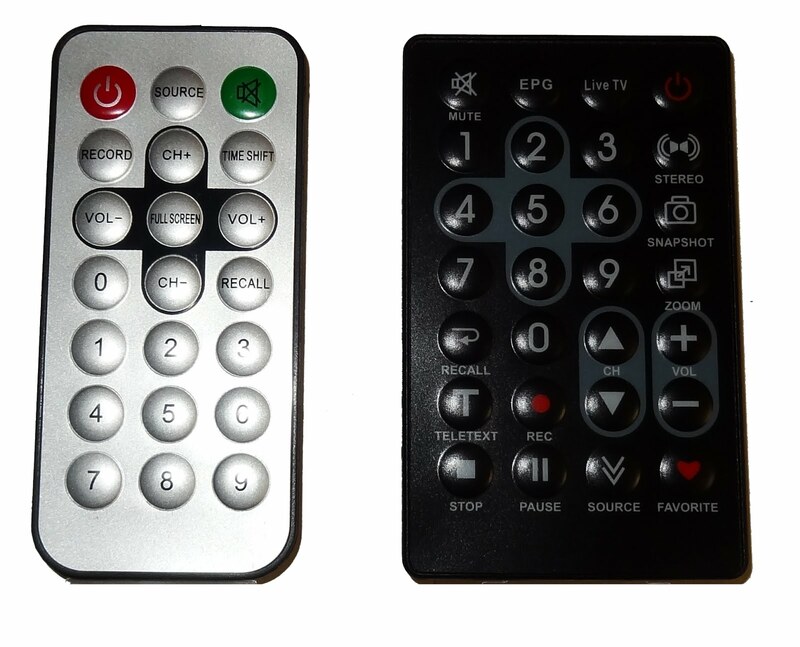 Silver remote in the image is most common, the black one is a curiosity, comes with Nooelec's XTR plus E4000 TCXO dongle. 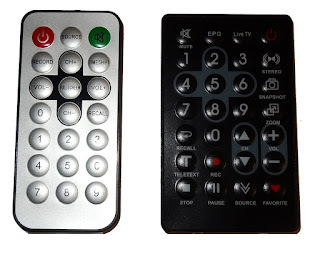 Remotes actually work for using dongles as TV tuner for DVB-T, which is not available in the USA, but widespread around the world. Online marketplaces (eBay, Amazon, alibaba, AliExpress, banggood etc) generally offer 14 or 30 day warranty with sub $10 dongles, caveat is buyer pays return shipping, which can be more than the original purchase price. 6 month is standard with rtl-sdr.com dongles. Nooelec offers two-year warranty with the Plus models. No exact figures publicly available at the moment, but I'd wager that 99.9% of RTL-SDR dongles are made in China. This means nothing, as the majority of consumer goods, from $1 toys to smartphones are manufactured there, but quality control varies widely. Chinese generic dongles used to fail, but recent ones seem to tick along nicely - even when assembly standard in not up to scratch. I recommend Nooelec and rtl-sdr.com dongles and equipment for one simple reason: they work. Yes, they cost 10-15 dollars extra, and if you're new to the hobby or money matters, $15 seems an unnecessary expense, but additional features and supplied accessories outweigh initial savings. My experience - which seems to be shared by quite a few individuals in the RTL-SDR community - is that Nooelec and rtl-sdr.com dongles are also very, very reliable. Even when I rarely read about equipment failure on a forum, next post is usually an update that the relevant manufacturer sent out a brand new one free of charge. Efforts to add more customer-enticing features are underway. Thumbnet recently announced a new receiver based on the RTL-SDR platform; called N3, distinguishing feature is external power for lower noise. Shipping around October, will cost around the $25 mark. Demand for affordable radio receivers is increasing, but the steady supply of $8-10 generic dongles with R820T2 chipsets make introducing a new dongle with more features, or altering the underlying architecture a risky endeavour. Rtl-sdr.com pulled off this feat with the new v.3, but pretty close to the limit of what's possible on a small printed circuit board. Size is one of the limiting factors choking further development; cramming more components into a device the size of a cigarette lighter (new v.3) or reducing dimensions (Nooelec SMArt and Nano series) is possible, but eventually, dissipating heat becomes problematic - run the new v.3 with bias-T on for a few hours to feel what I mean. More expensive SDR manufacturers (e.g. 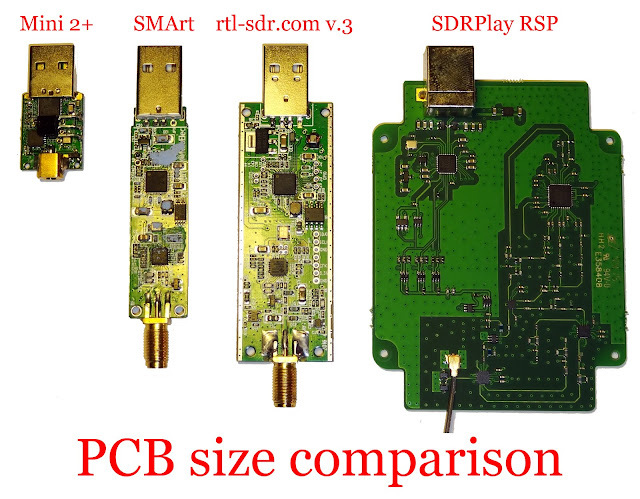 SDRPlay above) offer larger device sizes, partially to prevent heat-induced performance degradation with a larger printed circuit board. Reduced sensitivity due to excessive heat does not affect regular listeners or dependability at the moment with RTL-SDR dongles, and purists, or those seeking the last ounces of performance always have cooling options. - software-selectable LNA: the ProStick, for $17, has a constantly-on LNA at the moment. - filters: a constant and recurring argument against RTL-SDR dongles is no selectivity. Just like frequency drift, this will be remedied soon. The Soft66RTL3 has filters on board, which work quite well (the rest doesn't). - software-selectable bias-T: latest v.3 offers this feature. - upconverter: direct sampling is great, but a proper upconverter is better. - 12 or 16 bit: higher dynamic range would be nice. I know it's on your lips, some of the features above are found in the SDRPlay, AirSpy or HackRF. Problem is, all cost in excess of 100 dollars, and each come with unique weaknesses: SDRPlay has no bias-T, AirSpy platform isn't integrated into one box, and the HackRF is more or less on the same performance level as a 10-dollar RTL-SDR dongle (which I won't hold against it, it's not designed or marketed as a radio receiver). We'll see. Dongle development times are shortening - barely a few months passed between announcing Nooelec's SMArt and rtl-sdr.com's v.3, and there's still potential left in the RTL platform. What will we get for Christmas? Let's hear the difference between a generic chinese RTL-SDR dongle modded in 5 minutes, an RTL-SDR dongle with upconverter, and an SDRPlay on frequencies below 30 MHz with 20 foot of wire. Background information and testing notes in the Manifesto, underlined text are links, bring you to a new page in a new window. Click / tap images for full-screen glory. Direct sampling modded generic chinese RTL-SDR dongle: $8 from eBay, push a wire through a hole (detailed picture guide here link), connected to an outdoor wire. Premium RTL-SDR with Upconverter: Nooelec SMArt (review link) with Ham-It-Up v 1.3 Upconverter (review link) in a metal case, yours for ~80 dollars from Nooelec (manufacturer link). 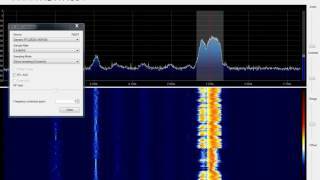 SDRPlay: All-in-one DC to daylight software defined radio receiver. $150 or thereabouts (review link, manufacturer link). The AirSpy platform consists of a receiver and an upconverter. Can't comment on performance as I don't have one. Reviews praise excellent performance (such as this one, link). Chinese all-in-ones: most of them are rip-offs, direct conversion receivers in nice wrapping (post how to avoid them link). Some of them feature an upconverter for 40-50 dollars, not tested so can't comment - I won't spend 50 dollars on a product with 30 day warranty when I've seen what's inside a chinese dongle (see images here, link). 3) SDRUno requires a restart when removing a dongle, and I'm not immortal. Hunting for signals: Find a station with SDRPlay, adjust gain and LNA for best audible audio, record, find same with RTL-SDR based setup, adjust settings for best audible audio, record, find same with a direct converter, record. Or the other way round. Switching between receivers took less than a minute. I'll be the first to admit that I'm nowhere near proficient with either SDRSharp or SDRUno; nobody is, save the guys who's written the software. I simply adjusted available settings to enjoy a particular broadcasting station, then recorded results. Broadcasting stations only due to availability, plus moral issues with ham SSB or CW conversations. Personal moaning: how much I hate SDRSharp, especially after this: constantly crashes. Wanted to record more, but given up after two days and the umpteenth computer restart. SDRUno was stable as a rock. Two 20 foot / 6.5m multi-stranded 1mm diameter copper wires strung from a first-floor window. SDRPlay and RTL-SDR with upconverter sharing the same antenna with the SMArt's supplied antenna cable and mount, antenna wire wrapped around base screw. Wire for direct conversion dongle wrapped around RG6 coax center conductor on one end, other end of center conductor goes directly into direct sampling RTL-SDR dongle. Above antenna configuration takes less time to sip a cup of tea: throw wire out from a window, wrap antenna wire around center conductor, connect other end to receiver. Done. Yes, grounding, capacitors, antenna isolation, better antenna to receiver connection, metal shielding, devoting time to software intricacies, a dedicated antenna tuner, an LNA4HF, bandpass filters, soldering, living in the Australian Outback, a T2FD, inviting NASA radio engineers over to dinner and listening to suggestions, a better sunspot cycle, plus countless other variables will undoubtedly increase receive performance. Third: SDRPlay (frequency in SDRuno). Direct sampling works to an extent, such as a <insert crappy automobile name here> is better than walking. 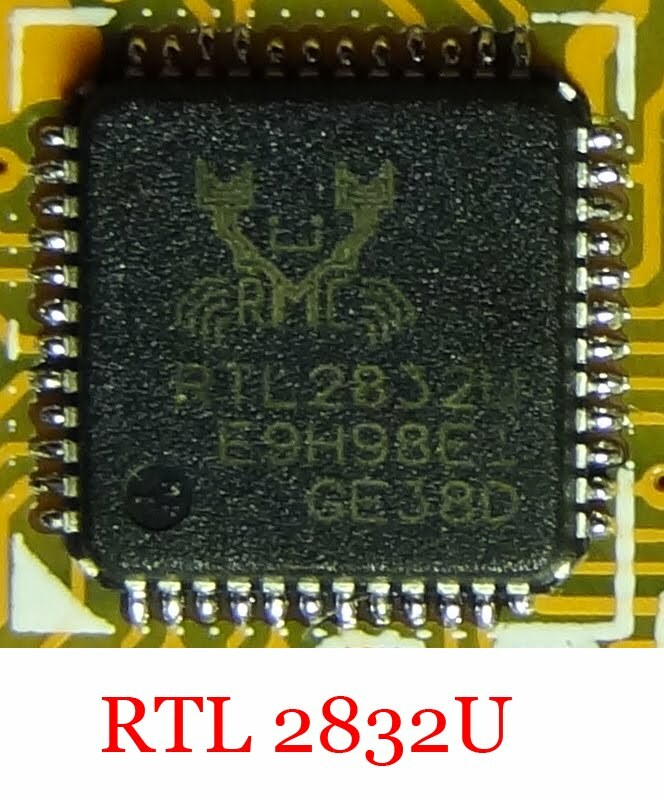 Inserting a wire into an RTL-SDR dongle can be done in a few minutes, and provide an opportunity to listen to stations below 30 MHz. Using an upconverter, such as the Ham-It-Up v1.3 here, is better in most cases, but an upconverter costs around $50. The SDRPlay is a great receiver, however, it costs $150 - you get what you pay for.